create your own or your family's personal website on the Internet? Is it really not just a blatant expression of narcissism, exorcism - self-assertiveness, geekiness or something else entirely un-Danish? Why not distance yourself from the anonymous greyness and show presence, personality, opinions and attitudes? The Web gives everyone that opportunity. It is democracy in its basic form. Use the freedom of speech! There are many who do not have the chance. After all you decide yourself how far you wish to go, and you are also to a large extent your own master in respect to how many people who will stop by your website. As in all aspects of life, it is ultimately the content and not the packaging, which is crucial. Granted - a very large number of Danish websites are amateurish and not very inspiring full as they are, with an uncritical cacophony of bouncing and dancing effects, intense use of color - and mostly with a content - often not updated - and totally uninteresting to the majority of the global population. Presence on the web gives identity and an opportunity to distance youself from the indifference and the abyss of anonymity. 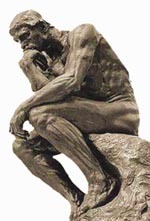 "Cogito ergo sum" - I think, therefore I am.